Greta's quilts and embroidery are exhibited at the bi-annual Living Threads exhibition. The next exhibition is at the Obolensky Building, Trent College, Derby Road, Long Eaton NG10 4AD in April 2019. Our work is shown in the quilt competitions at national and international shows, including the Festival of Quilts every August at the NEC, Birmingham. We both have work in the current World Quilt Competition touring the USA. Our quilts will also form a touring exhibition within the Grosvenor Shows events commencing January 2018. Weybourne Beach: Inspired by the pebbles and seaweed on the shingle beach at Weybourne, Norfolk, January 2018. 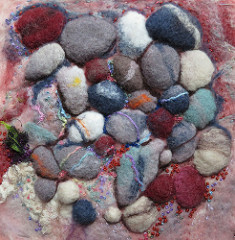 Needle felting and hand embroidery, finished size 30cm square. Made for the Embroiderers Guild Members Challenge Competition 2018. The theme chosen by the guild was Underfoot. My entry won 1st prize for Colour, Julia Caprara Award For Colour, April 2018. See it on myFlickr page here. *25 St Mary Axe, London, won the Piecing Prize at the Scottish Championships 2013.